ORC Wakelyns Population on sale! Seed of the ORC Wakelyns Population is on sale from Walnes Seeds. Contact Andrew Cooper. This is a good opportunity to get a new concept of wheat into your field. It is not a variety, as individual plants are not identical, and it is not a mixture either. Think of it as a large family, in which each plant is different from each other but there is some relatedness. It is the outcome of 107 crosses between 20 parents, selected to be either high quality or high yielding, bulked and reproduced year after year on organic farms. Change, as the best performing types become more prevalent in response to environmental differences as a result of evolutionary change. Thanks to the 'four Cs', it performs well on organic farms, because that’s what it has grown to know. In fact, we have found that the Wakelyns population is able to withstand stresses thanks to its diversity. For instance, it exhibits resistance to pests and diseases as a result of: a) being a crowd of different types that do not offer a uniform breeding ground for pests and diseases to spread; and, b) having been grown and reproduced on organic farms in the UK, it 'knows' the local pests and diseases that it has been exposed to better than us, and certain individuals have resistance to them which can be passed on. The population is also able to withstand the unpredictable stresses that commonly threaten the performance of common varieties. Several times we have seen it performing very well when sown in sub-optimal conditions, e.g. much later than recommended, whereas common, uniform varieties sown in the same place, and in the same way, have completely failed. 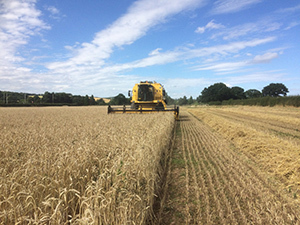 Mark Lea of Green Acres Farm in Shropshire recently tweeted "ORC Wakelyns Population Wheat looked great in the field and looks great in the store! Restoring my faith in organic wheat!" Not only that, it has good baking quality and is as nutritious as most common milling varieties, as well as being suitable for animal feed. We are developing the bread-making process with the Small Food Bakery. Read more here: and order your seed now to be part of this exciting project!